Please fill in the form below with all the required details and your preferred date. We will get back to you as soon as possible with confirmation of your booking. Last Name: * Name is required. Motorcycle GPS tracking system with SMS early warning. 24/7 Manned Monitoring Center for continual Monitoring and Support. Click here to enquire. 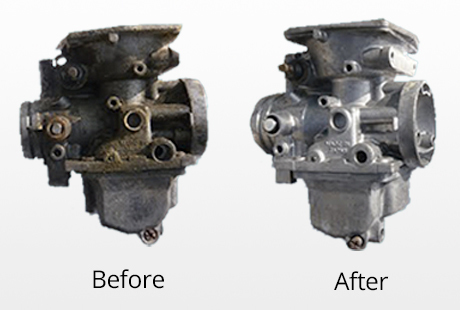 Only £40 per stripped down carburettor! Click here for more details. Cleaning carbs manually by hand has now become a thing of the past! We've now added power of Ultra Sonic Cleaning to our array of services. This technology uses ultra-sonic soundwaves to agitate the water or cleaning solution to restore the most dirty of items that would otherwise be a pain or near impossible to clean. This technique gets to places that you can't get a brush or wire cloth to, and cleans all cracks, recesses and blind holes. The carb is placed in a chamber, which is then lowered into the solvent or cleaning solution, then hit by ultrasonic waves produced in the fluid made by an electrical signal produced at an ultrasonic frequency. QB Motorcycles has received your enquiry and will be processing shortly. Once processed you can expect a call from one of the team to confirm your booking.